The paintings by T.C. Cannon that comprise the Bloch Collection represent the finest examples by a multifaceted artist whose voice and talent resonate and inspire nearly forty years after his untimely passing. The major canvases in the Collection speak to multiple themes—his early mastery of color in Man I’d Like to Have that Pinto Pony; his compelling and ironic twist on the Plains warrior motif and Kiowa history in Washington Landscape with Peace Medal Indian; his regard for family heritage in Grandmother Gestating Father and the Washita River Runs Ribbon-Like; and his tribute to the power of music in A Remembered Muse. Each work of art has a palpable power to engage, foster ideas and be truly memorable. It is the finest group of T.C. Cannon’s paintings known to exist in either private or public collections and is the first time in 20 years since they have been exhibited in public. T.C. Cannon (Kiowa/Caddo) 1946– 1978. 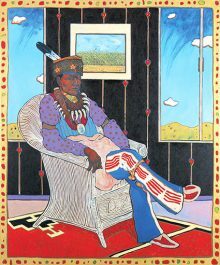 "Collector #5 (Man in Wicker Chair)" 1975, oil/acrylic. From the Nancy and Richard Bloch Collection. Reproduced by permission of the Estate of T.C. Cannon. © 2017 Estate of T.C. Cannon.